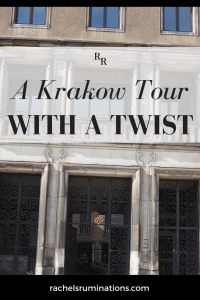 Crazy Guides’ communism tour advertises a visit to Nowa Huta, a “model communist city.” Built starting in the 1950s, this experiment in communist community-building is considered a landmark of Soviet-era socialist architecture and urban planning. 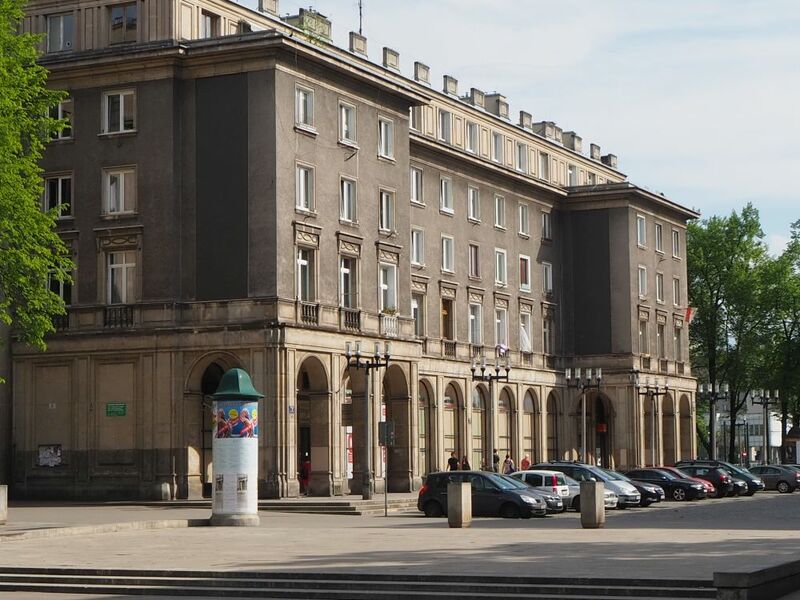 that Nowa Huta would be full of grim communist-era monstrosities like you see in some cities in Eastern Europe: grey, featureless, and massive concrete blocks, crumbling from lack of maintenance. I was wrong, except that the buildings were indeed grey, though a good steam-cleaning would easily solve that. But they were not ugly. Aided by the beautiful spring green of the trees lining the roads, the neighborhood looked positively welcoming, complete with vintage streetcars and families bicycling by on neat bicycle paths. It reminded me in some ways of Paris, with its graceful plazas, wide, tree-lined boulevards, and buildings that curve gracefully at the corners. Generally between five and eight stories tall, some buildings sport arches and columns on the ground floor, which gives them a certain dignity. Things to do in Krakow: Ride in a Trabant! I took the tour with one other blogger, Lydia Yang of Lydiascapes. Fortunately she was fit enough and small enough to clambor into the back seat easily, leaving me the front seat. Goshka, our guide and driver, is a talkative and knowledgeable woman, too young to have experienced communist Poland. I was delighted when I realized that our transportation for the tour was a 1966 Trabant, built in East Germany. 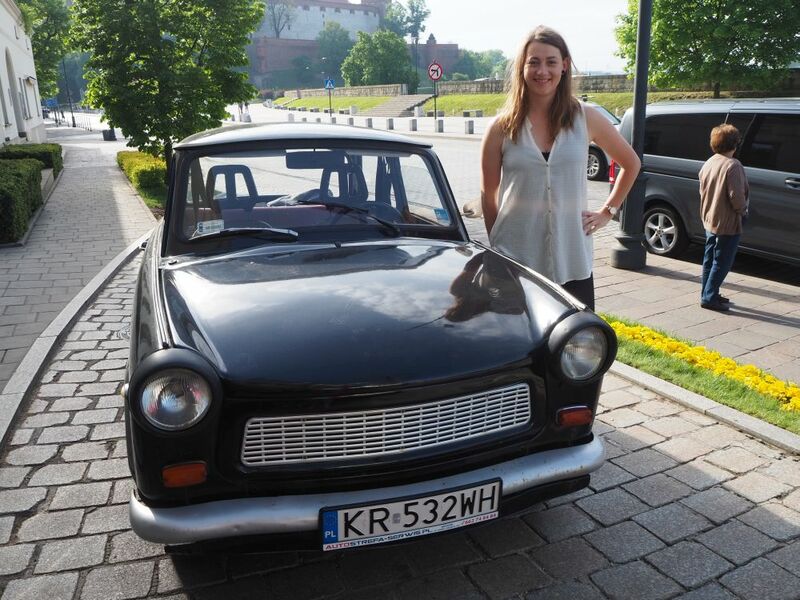 Goshka with the Trabant, who would together take us on our Communism tour of Nowa Huta. I’d never been in a Trabant. I grew up in the US during the Cold War, and my view of Eastern Europe was very much about how much worse everything was there. Trabants, as far as I knew, were some kind of poor quality tin can that most Eastern Europeans couldn’t afford anyway, as their ruling class got all the privileges while the workers stood in lines for food. Taking a seat beside Goshka, I worried a bit about this tin can I was now strapped into. Its simple controls – not much besides a gear shift, a clutch, a choke, a knob for heating, and a speedometer – seemed vaguely familiar from my childhood. Goshka explained that it isn’t actually a tin can; it’s mostly made out of plastic. This didn’t reassure. While the front seats of this particular Trabant have seatbelts – added later – only the hip belt fit me snugly. The cross-chest band would have been useless in an accident. I learned later that the gas tank sits right in front of the passenger seat. Perhaps this was a death trap. Goshka drove the Trablin capably, and I enjoyed the thrill of the ride. With the windows open on a lovely day, each acceleration produced a conversation-stopping roar and a strong smell of exhaust. It also rolled me back in my seat just a bit; I guess it wasn’t quite so firmly attached to the floor as intended. It took 15 or 20 minutes to get to Nowa Huta, and Goshka filled us in on the history on the way. The workers who did the construction work on the original central part of Nowa Huta moved in and lived there, rent free, once it was finished. Then they worked at the nearby steel mill. 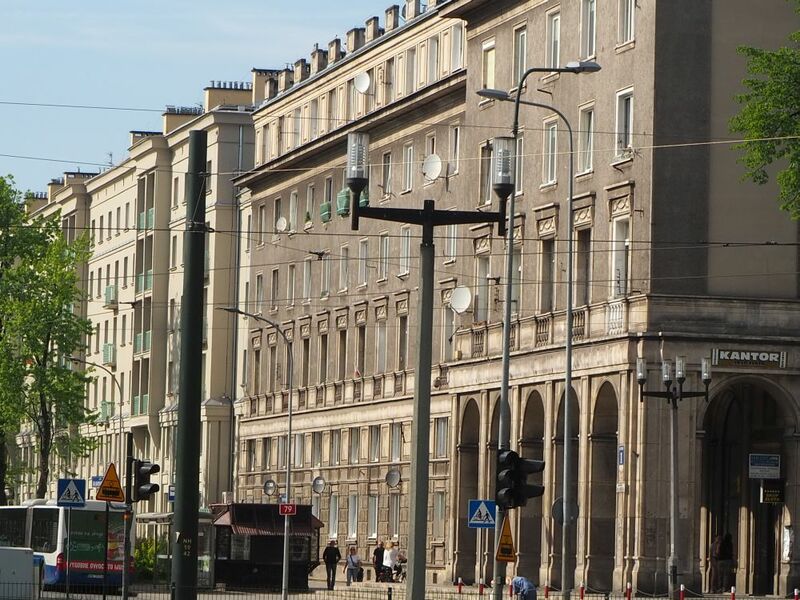 Buildings on a wide boulevard in Nowa Huta. The expansion of the “worker’s paradise” took place in phases, and the quality, it seemed to me, and the aesthetics, went down over the decades. While the original apartment buildings dating to the 1950s are attractive, the newer blocks are, well, blockier, and uglier. According to Goshka, Nowa Huta has for a long time not been considered a good neighborhood, mostly because of the pollution from the steel mills nearby. The soot darkening the facades is evidence of the factory’s glory days. Today, though, Nowa Huta is making a comeback. The cost of rental or purchase is a bit lower than in the rest of Krakow, and it draws young families particularly. 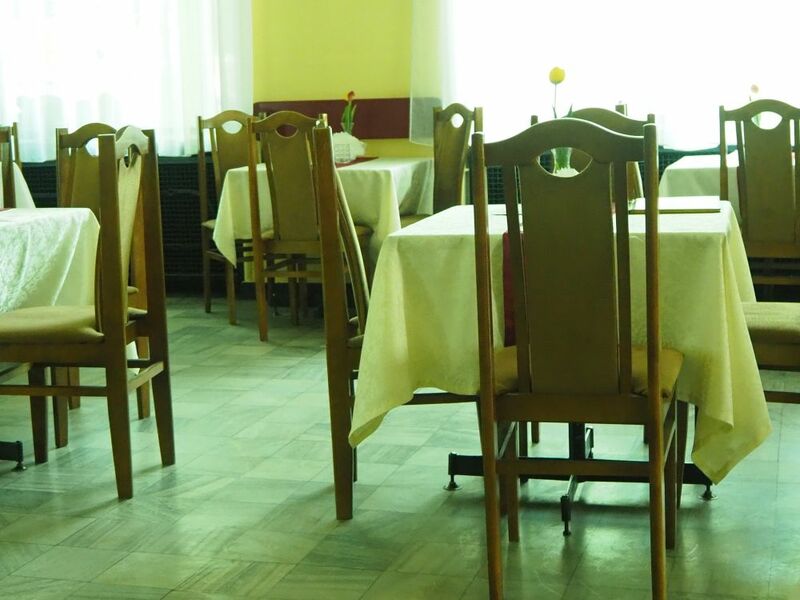 Our first stop was Stylowa restaurant, a holdover from the communist era, when it was considered an elegant place to eat or drink for a special occasion. That air of suspended time is still visible in the high arched windows and the age of the waitress. Turning down a vodka, I chose a kompot, a traditional Polish stewed fruit drink. Goshka showed us historical pictures of Nowa Huta, including the obligatory Lenin statue that once graced the central plaza, Plac Centralny. 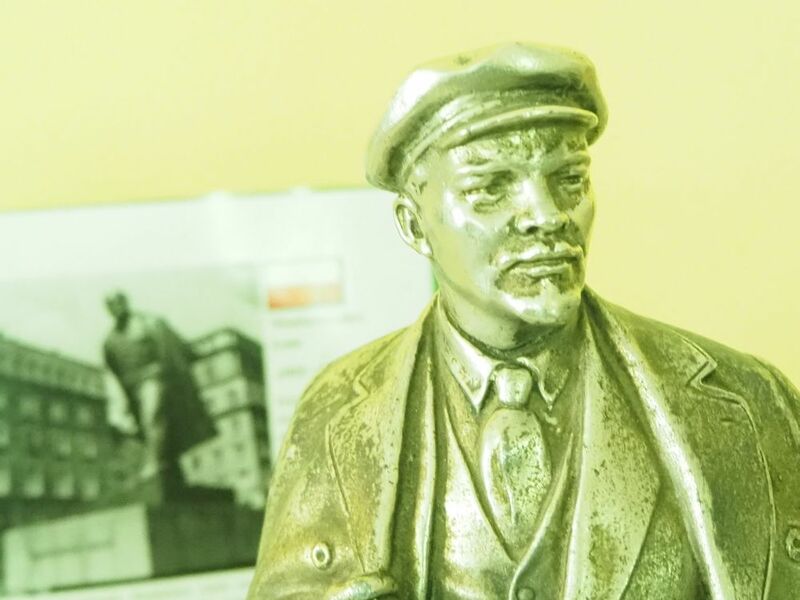 Lenin now resides in a museum in Sweden, replaced here by a monument to Solidarity. Really more of a circle than a square, the Plac Centralny’s new name is Plac Centralny im. Ronalda Reagana, or Ronald Reagan Plaza. Returning to the car, we drove through the oldest part of the neighborhood and along the tram track that would have taken the workers to and from the steel mill. Still in operation at a minimal level, it employs only a few hundred workers these days instead of the thousands who used to work there. We could see the smokestacks behind the trees, but on a Saturday the factory grounds were quiet. Instead, we peered into the two buildings flanking the factory grounds entrance. 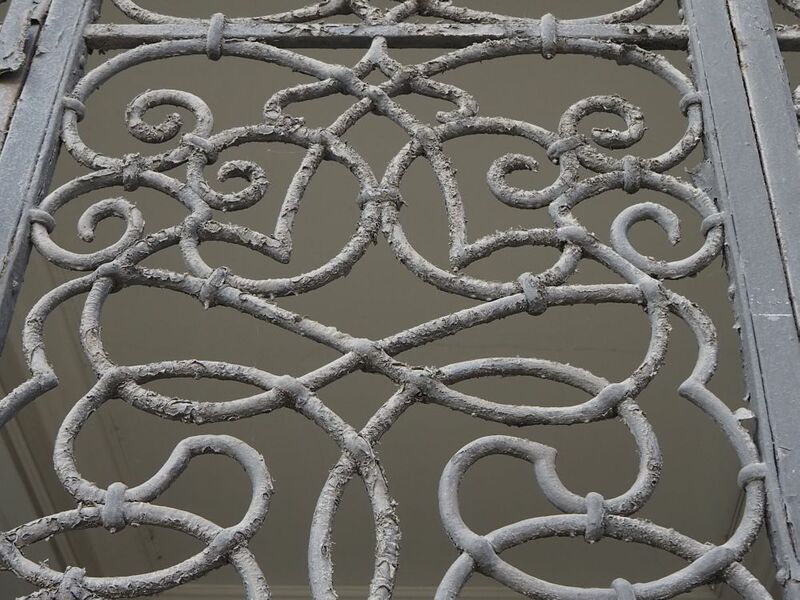 Once the offices for the factory, they retain a measure of elegance despite their decay. One is still used for events, while the other is abandoned. 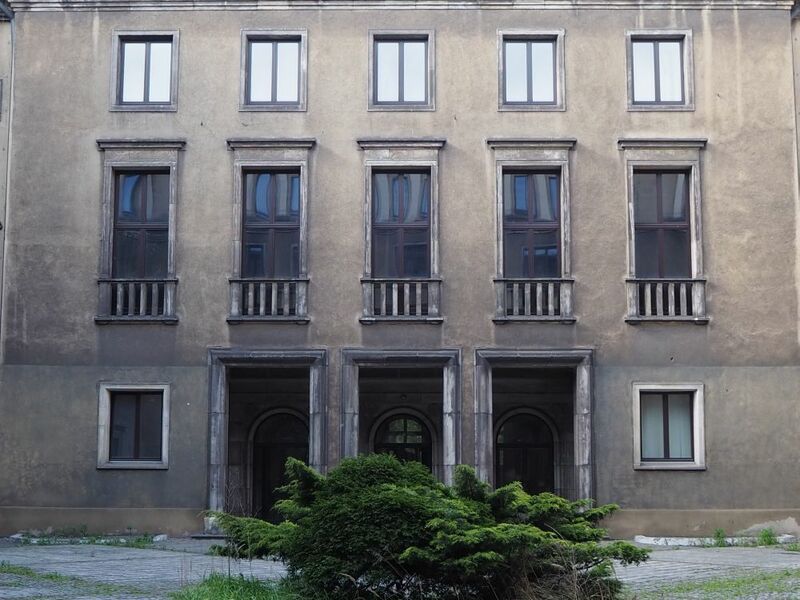 The inner courtyard of an abandoned administration building at the steel mill in Nowa Huta. Another short drive, and Goshka parked in front of an apartment house on a quiet side street. Two elderly women sat on a bench nearby, studiously ignoring us as they basked in the spring weather. Pulling out a set of keys, Goshka led us inside. The Crazy Guides company took over an apartment after its elderly occupant died, and keeps it as a living museum of sorts, to show visitors what life was like for Nowa Huta residents in the communist era. Entering a paneled hallway, we could quickly see the entire apartment: a kitchen, three rooms and a bathroom. According to Goshka, how people set up the rooms depended on how many people lived there. While one of them might have been meant to be a living room, in many cases all of the rooms served as bedrooms because they housed so many people. Sometimes a family would receive one or more complete strangers, assigned to live there as well. Goshka ushered us into what is now set up as a living room. Sixties-era cupboards display odds and ends: chotchkes, as my family always called such items that sit on shelves gathering dust. It reminded me of the Communist Consumers Museum we visited in Timişoara, Romania. At the same time, many items, as well as the furniture itself, brought back images from my childhood. As I realized in Timişoara, life in Eastern Europe, at least for a child like me in the 1960s, didn’t look so very different from life in the US or Western Europe. A blockish TV sat in the corner, now rebuilt with what looks like a tablet screen inside the original case. We watched a short film and Goshka left the room. She returned carrying a tray laden with vodka and pickles, apparently a common combination in Poland. 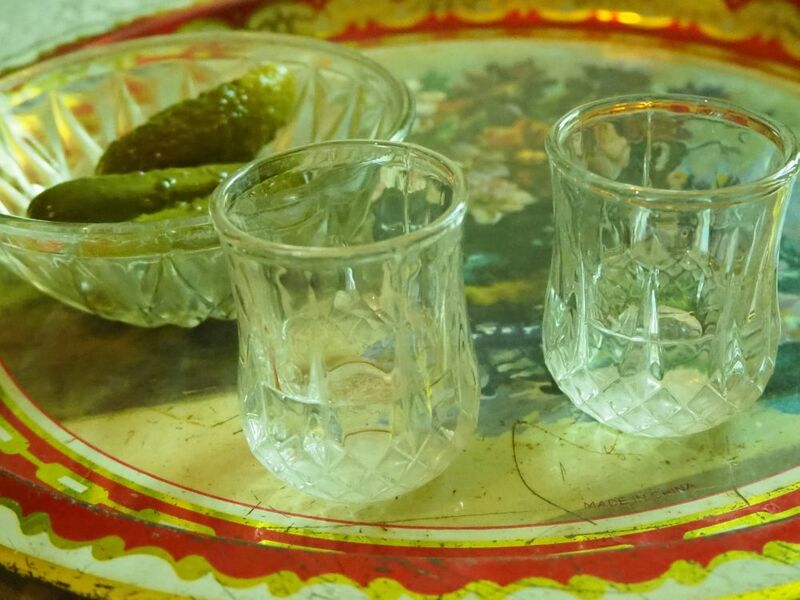 The vodka, kept in the vintage freezer in the kitchen, went down easily, and the pickle was indeed a pleasant taste to follow it with. Don’t worry; Goshka didn’t drink any vodka. Our last stop was the Lord’s Ark Church, an interesting sight, when you think that religion was more or less forbidden in the communist era. The original plans for Nowa Huta did not include any churches at all. But the inhabitants of Nowa Huta wanted a church, and lobbied for years for permission to build one. Eventually receiving permission in 1967, they did not receive any money or materials to build it with. Instead, they contributed their own labor over a period of years, brought their own materials – evidenced by the river stones used on the exterior – and gathered donations from overseas. It was completed in 1977. The result is an impressive structure: rounded and spacious to resemble Noah’s ark, with a row of bells hanging exposed outside (a gift from the Netherlands). Inside is a soaring space filled with natural light. The massive crucifixion statue is masterful. The Jesus figure’s posture is sail-like to reflect the church’s focus on the Noah’s ark story. On the altar is an artwork containing a moon rock, a gift from Pope Paul VI, who in turn received it from the Apollo 11 astronauts. One side wall boasts a stained glass window depicting Moses parting the Red Sea, a reference to the end of the communist era, according to Goshka. 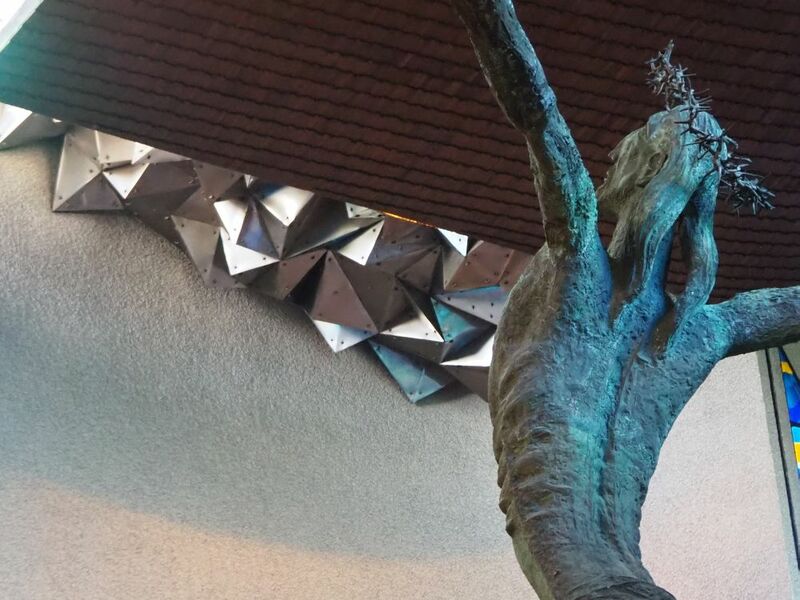 The Jesus statue in Nowa Huta’s extended from the floor to well above our heads. On a Saturday afternoon, when we visited, worshipers filled the church, both in the large main space and in a smaller chapel downstairs, testimony to the deep faith of the inhabitants of Nowa Huta. We headed back toward the old center of Krakow. I enjoyed the impression we made once we were in the center of the city. Alerted to our presence by the roar of the engine, people turned to look as we passed, smiling nostalgically at the Trabant. 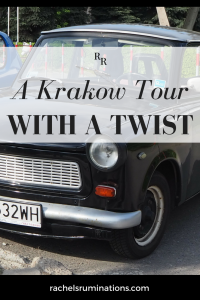 I would certainly recommend this tour, though as much for the Trabant ride as the tour of Nowa Huta. When you sign up, make sure to choose the tour that includes the visit to the apartment. That was the part that gave the best glimpse of what life in communist-era Poland might have been like. 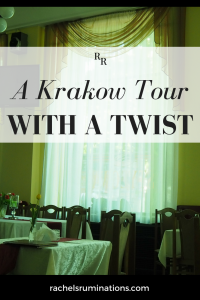 You could certainly get to Nowa Huta on your own, as well as the Lord’s Ark church. Trams 4 and 10 both go from the center of the old city to Ronald Reagan Place in 35 minutes or so. A 25-minute walk from there will take you to the church. However, if you want the ride in a Trabant or to see the inside of an apartment, you’ll need to take a tour. Crazy Guides offers a number of different tours. The one we took was a combination of two: their standard communism tour with the visit to the apartment as an added extra. I’d recommend taking the communism deluxe tour so that you can see the apartment, and it comes with a meal at a “milk bar” as well. I ate at one of those on my own on a different day: it’s a traditional cafeteria-style restaurant that offers cheap, nutritious meals for a very low price. They also offer a number of other experiences, such as touring a Cold War nuclear bunker or shooting an actual Kalashnikov. Standard communism tour: daily by arrangement with pick-up at your hotel. 2 1/2 hours. €38 per person. Communism deluxe tour: daily by arrangement with pick-up at your hotel. 4 hours. €48 per person. If you enjoyed this article, don’t forget to share it on social media! The images below are perfect for Pinterest! How fascinating! I would love to take this tour and ride in the Trabant. Your descriptions were fabulous. I would have loved to see more photos of the apartment. The buildings’ exteriors are almost Parisian, aren’t they? Too bad the esthetic declined with time. My photos from inside didn’t come out good because the lighting was very low and I’m using a new camera I don’t really understand yet. I’ll add one from the bathroom. 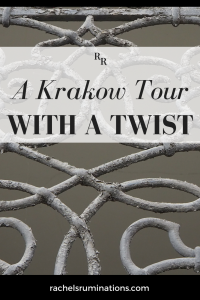 How fortunate you were to find a guide in Krakow who could transport you back in history! Yes, she did a good job! I can’t wrap my head around taking this tour for enjoyment. I would be interested in seeing Krakow, and meeting the folks from Crazy Guides, but everything looks so bleak and barren. Perhaps it is just my mood, as I am looking out my window at a very dark and dreary day. Thx for this look at Communist Poland. It wasn’t nearly as bleak as I expected it to be. I went because I find the history so interesting. I am somewhat with Doreen as it looks so austere but this is likely one that you need to try out before coming to any conclusions. I love the history though and would also find it interesting! Great read. 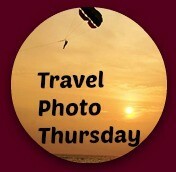 I will be visiting Krakow before TBEX in July and am looking forward to seeing the historic parts of town. Don’t think I will be doing this tour though-reminds me to much of growing up in Romania in the 60’s. Not all nostalgia is always pleasant. This tour looks really cool. As I’m in the middle of nowhere at the moment, I’ll just have to come back when I have better wi-fi in order to see the images!